EPSA, from 17th to 21th February will join the world’s largest annual food & beverages trade show Gulfood 2019 at the Dubai World Trade Centre. Under the theme “The World of Good. The World of Food” the event is all about consumer trends, innovation, unveiling opportunities and a real battle of flavors. 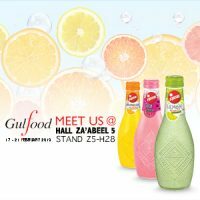 Gulfood welcomes over 98.000 attendees from 193 countries and more than 5.000 exhibitors showcasing their products. Find us in Hall: ZA’ABEEL 5, Stand: Z5 – H28.